Hello, oh beloved readers. I’m finally starting to peek out of the fog that’s been wreathing my head for the past month…two months? Three? It’s hard to tell sometimes. My depression and anxiety have had the upper hand on me of late. But a few warmish days have encouraged a bit of momentum. I’ve been doing small things, like cleaning the kitchen, tending my indoor houseplants, and other small accomplishments. It feels nice to do something useful. To be able to identify a problem (this kitchen is a wreck and it’s getting gross) and to solve that problem (hey, maybe doing the dishes is more effective than sitting on the floor and pouting like a whiny toddler). Washing your face. Drinking a glass of water. Remembering to eat, and actually eating. Changing clothes. Brushing teeth. Taking vitamins. Walking around outside. Stretching. Dancing. Small steps are helpful. Imagine walking around in a grey fog on a road that you know is fraught with danger. There’s quicksand, brambles, poisonous creatures just waiting to latch onto you when you take the wrong step. Fear makes inaction seem like a safer option. You can’t take a wrong step if you refuse to move…but you also never make progress on your path to get out of the hellish swamp. Deep down, you KNOW there’s no fog, no quicksand, and no snakes. You KNOW that what you are experiencing is a chemical imbalance or whatever, but it doesn’t make it easier. It still feels very real and it is not something that can be banished with just plain old positive thinking or happy little songs. It becomes so easy to just lay down and wait it out. That’s where I’ve been for the past few weeks. Stagnant. For me, there generally comes a moment where the fog suddenly clears a bit and so I cautiously move forward as much as I can. Try to rediscover momentum. Sometimes the fog returns, but sometimes it fades away to the edges so that the road is clear. The moment of clarity is when the stagnation and the bad coping methods must be put aside. I’ve recently hit that break and so I have been investing in projects with future returns, like brewing wines and fermenting food. This gives me a focus and a scope, so that I can look ahead, look up from the ground, and make some progress forward. Another small step is to keep focused on the good things that I achieve, so that when the doubts and fears and fog come rolling back in, I have something to remind myself of what I can do. I have been using a cute little app called Habitica which helps with that. It’s a checklist app that’s built in the style of an old school RPG game. You get XP for finishing projects, you can acknowledges daily habits (both good and ill), and you can “buy” neat equipment when you level up. It has helped me to realize how much work I do get done, while keeping track of the things I still need to work on. It feels nice to mark things off as completed. It really helps. And since this is supposed to be a food/brewing/herbalism blog (cough cough) here’s a teaser of a recipe I hope to be sharing with you soon. 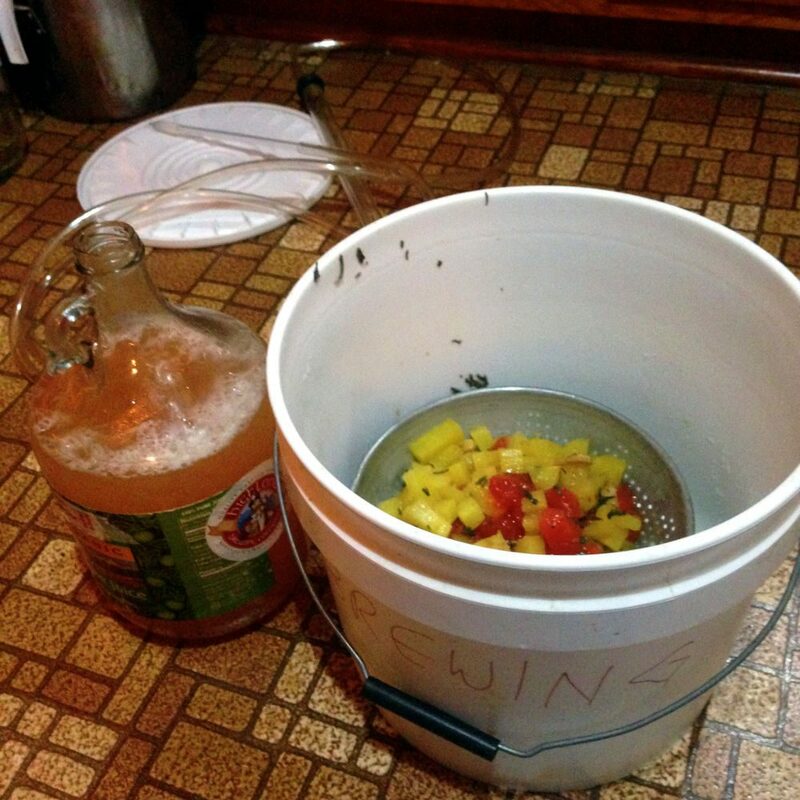 A gallon of wine made with a pineapple and papaya. After a few days of fermenting in the bucket, it now lives in the jug to bubble away. The strange thing about this brew is that it smells nothing like pineapple or papaya. It smells like a blooming spring rosebush in my kitchen, or like someone spilled a bottle of rosewater. It’s uncanny, but beautiful and a blessing all the same. This is me, hoping all of you are keeping your heads above water out there. ← Merry HoHo, Happy Holly Daze, Death to 2016! Thank you for sharing. It helps to be reminded that others are struggling with winter too. It’s a thing that happens and a thing that passes. I’m glad you’re getting peeks through the fog. I am too. Spring is coming, slowly. Planning spring camping and spring searching for ephemerals has been helping me. Best wishes to you! <3 It is always hard to put myself out there in a very personal way, and I'm always so honored by th responses of people who understand! <3 Thank you! Best wishes to you, too! Time to go organize some seeds for spring planting! I to have trouble with anxiety and depression. I am going to try the app. Sounds like it is like a poke in the ribs to remember what I can do. Blessings and Love Surrounding You! Thank you for this, Amber. Such an accurate description of depression and the slow clearing of the fog. Also, thanks for the reminder. I had been using Habatica for a while, but got very busy & far from depressed, so I stopped. I’ve been under the fog for quite a while now & forgot all about it.